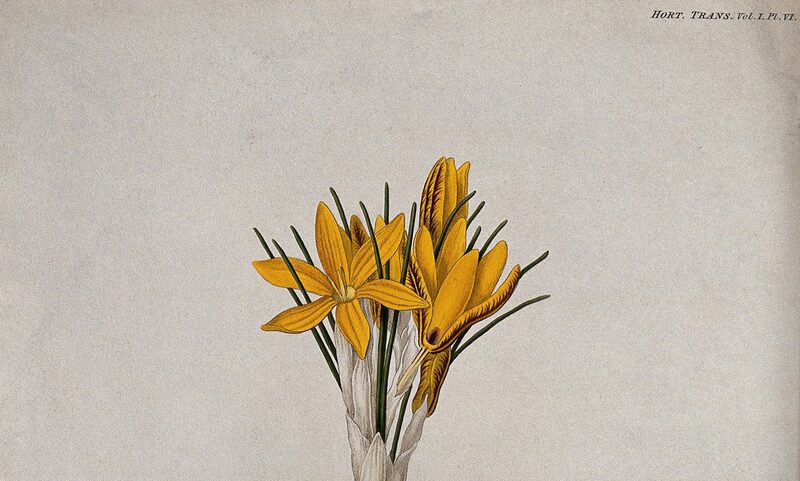 “Crocus metallorum is made from prepared antimony, and if it is infused in grape wine it makes emetic wine, so this crocus is taken solely for purging and evacuating from above and below; it is used for almost every sort of illness, as long as the patient still has enough strength. The dose is from 18 to 30 grains, which is given to the strongest. It is neither heated nor boiled, nor mixed with anything else, it is simply swallowed in wine, or in water, or with sugar, or with a fig – indeed it doesn’t matter with what as long as it is swallowed. Cinchona is a bark from a tree which comes from the New World: an excellent and near infallible remedy to cure all sorts of fevers which are not accompanied by oppressions or inflammations of the chest: it was an English doctor who recently brought these barks to France. We think we sent you the method to use this in the last year, but just in case we’re sending it again this year.“ (p. 160). The inclusion of this paragraph raises a number of questions about missionary medicine. In my previous work, which explored conversion to Catholicism in Southeast Asia, I discussed how missionaries often presented themselves as healers in order to convince people of their spiritual powers. This ‘recipe’, however, points to another set of issues which merits further investigation, relating to missionary engagement with medical developments and controversies in Europe, and about missionaries’ interests in using relatively ‘new’ techniques and materia medica on their mission fields. The first cure – crocus metallorum – is a preparation of a substance which has been discussed before on this blog: antimony. The discussion of its use in this letter is almost an anti-recipe: the remarkable effectiveness of this remedy was such that the composition of the delivery mechanism was unimportant. Indeed the initial illness of the patient hardly mattered – this was a true cure-all. The use of antimonial cures had been extremely controversial throughout most of the seventeenth century. Following a décret of the Sorbonne’s faculty of medicine, and an arrêt of the Parlement of Paris in 1666 permitting their use, they became increasingly sought after. La calcination Solaire de L’antimoine. 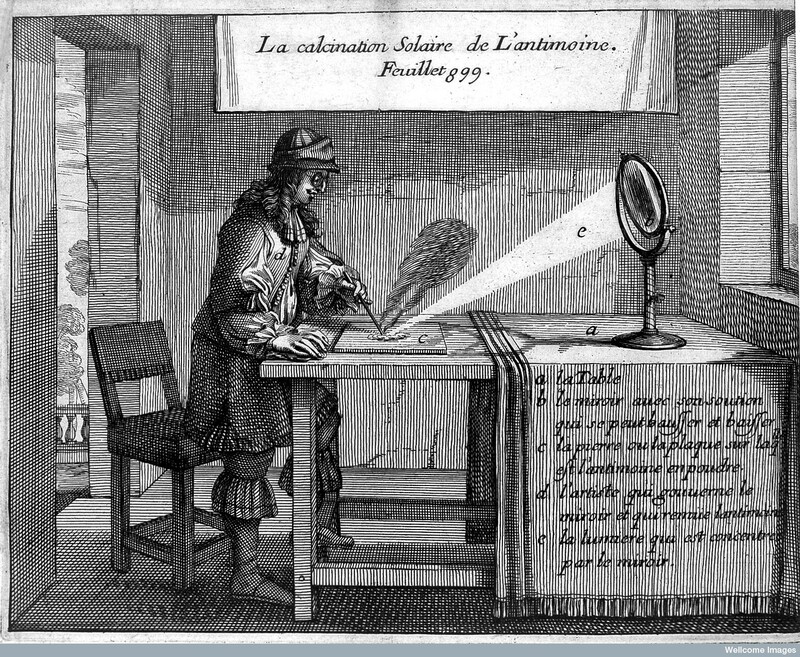 From Nicholas Le Fevre, Traicte de la Chymie (Paris, 1660), opp. p. 899. 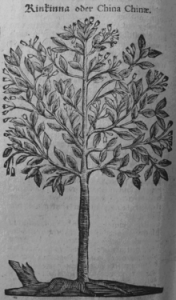 The second remedy is also a miracle cure of sorts: the ‘near-infallible’ bark of the Cinchona tree, a source of quinine, effective against malarial fevers. No mention is made of the rival missionaries who were associated with this remedy in Europe: the Jesuits, who played an important role in its dissemination. We know from other letters that French Jesuits had supplied some of this bark to Missions Étrangères priests in Siam in the 1680s. But this letter – which had earlier mentioned the tensions between the two societies – only mentions the ‘English doctor’ credited with introducing the substance to France. This is most probably a reference to Robert Talbor, whose secret recipe for a fever cure based on Cinchona had been revealed in a book published in 1682, shortly after his death. The letter promises that a fuller account of the means of preparing this bark will be sent to Vietnam. I have yet to find this account, but it would be interesting to compare the method to the Talbor recipe, and to Jesuit recipes of the same period. Both substances held great promise: they seemed to be extremely efficacious and had become famous, even fashionable in France in the last decades of the century. The use of both medicines by royalty had undoubtedly added to their appeal, and encouraged their acceptance by the medical establishment. Louis XIV had been successfully treated with antimonial wine; Talbor’s cinchona remedies were also credited with saving the life of the king’s son. Yet both remedies were also controversial. Naysayers continued to raise doubts about their efficacy and safety, and about the probity of those who would prescribe them. In many ways they represented new approaches to medicine, championed by those who sought to isolate universal remedies and infallible cure-alls. It seems that members of the Société des Missions Étrangères embraced these approaches, and helped to introduce these ideas to their mission fields.